With Choice Privileges you can expect two type of systemwide bonus offers. 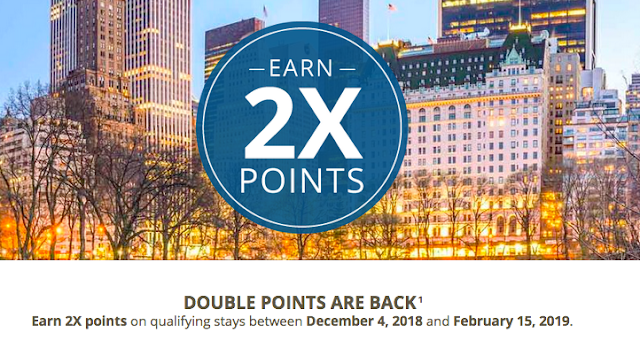 Either the Earn A Free Night/Gift Card offer or the Double Points promotion. Seeing that fall was the Earn a Free night promotion it is only fitting that winter sees the Double Points offer! Right now until the middle of February you can earn Double Privileges Points on all eligible stays as long as you maintain a U.S. or Canadian residency. Choice Hotels properties in the following countries are excluded from this promotion: Japan, Norway, Sweden, Denmark, Finland, Iceland, Lithuania, Estonia, Latvia, Guyana, and Ecuador. Find many more Choice Privileges Bonus Point offers here!